The TriBeCa campus of ARROJO cosmetology school offers over 10,000 square feet of spectacular space in a dynamic and historic downtown neighborhood. The state-of-the-art facility features five tailor-made classrooms, a 70-seat lecture theater, mezzanine stage and auditorium, a creative space for photo shoots and new media projects, a central locker room, all alongside a 38-chair student clinic floor. Customized chairs, styling stations, and retail units augment a design that allows our culture of excellence through education to continue to thrive while making students feel a part of something special. The SoHo campus of ARROJO cosmetology school is a brand new 5,000 square foot facility offering a luxurious boutique experience for students to flourish. 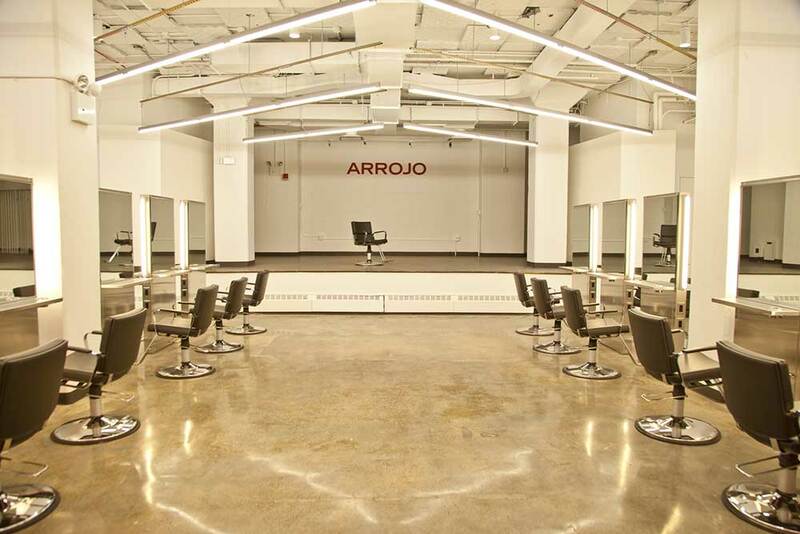 The modern, boutique-style beauty school features two classrooms, a retail store, an 18 chair student salon, and a design layout that mimics the the stylish industrial minimalism of ARROJO studio. Customized chairs, styling stations, and retail units augment a design that allows our culture of excellence through education to continue to thrive while making students feel a part of something special. Do what you got to do. In both locations, each classroom is a versatile workspace ideal for your personal development. Here you'll learn theory, watch demos from instructors and guest artists from ARROJO studio, and workshop to practice your new technique. In the classroom, you'll also learn client customer service skills, how to retail, and how to build and manage your business. In the student salon of each campus there are state-of-the-art stations, dispensary and backwashes, and everything else you'd expect to find in a professional salon space. Here you'll perform all the practical skills taught on the course, from the most fundamental to the most advanced. Each service is carried out on student salon clients, putting you in a real world situation where professionalism, high-quality services, and the ability to communicate are the benchmark for success. This dynamic setting is the perfect place to practice new skills while under the guidance of our professionals instructors. Learn to be a rounded professional. Each campus also features its own retail store. The retail environments give choice and education to clients, and real world retail experience to you. For stylists, retail ability is intrinsically linked to client communication and business building: If you can sell a product by showing your client how to use it, it means you're building a relationship and the client will be twice as likely to return to you. The stores feature high-quality hair and beauty products and an extensive range of styling tools, giving you a fantastic opportunity to practice this vital part of your new career. There is also a professional retail desk team to assist you, and the clients. Love it. Live it. Be it. It's all yours. New York: No place has more energy, excitement, or inspiration. It's the world's capital of fashion and beauty; a tailor-made catalyst for your cosmetology career because no other city offers the wealth of opportunities found here. New York Fashion Week connects you to the latest trends; the arts and culture motivate and influence; the spark of the city streets inspire. New York City, being New York City, gives you the creative edge. And what better place to live? Think of the restaurants, bars, and clubs. Think of the theater and independent film. Think of the unique and historic neighborhoods. Think of the parks, galleries, and architecture. Think of the shopping. Think of the people. It adds up to the city that never sleeps; the city that has it all.